Thank you very much for taking the initiative for something like Bonsai on Android. It's the only reason I'm still carrying my Centro around. Already a couple of basic outlines are migrated, can't wait to get my GTD system over! Nice to hear that you found and used the Bonsai import. I also plan a sync with Bonsai desktop files. In the meantime you can help yourself with import/export. Sync would be great, I am now using Dropbox to get files to my Nexus. Are you planning to expand to full Bonsai functionality such as multiple dates, filters, etc? 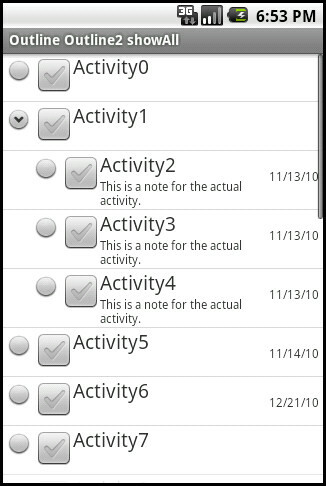 All dates, Bonsai has, are on the roadmap, the categories and a category view (contexts) and priority. An USB sync as well. The other things - depending how many people ask for it. DropBox sync is a good idea - I will think about how to handle it as automatically as possible. Great, sounds good! I would be glad to test betas for you, as I have a big outline where I do my GTD stuff. Filters are very important for me! Please send examples of your personal filters via mail. You find my address in the Android Market. Filters should be discussed. Also hopeful for Expand/Collapse All/Family/Subfamily, etc buttons. The good old Palm Times... We all remember. - Any other ideas? A free web service providing tree structure and dates and (which is important) an API/interface for syncing. Expand/Collapse Subtree is also planned.